Playing off the wicked success of the TCX X-Street and X-Street Air shoes, TCX is dropping the new TCX Street Ace Air Shoes for Fall 2016. The new Street Ace Air offers the same great protection as its predecessors in the form of ankle cups and heal/toe counters. 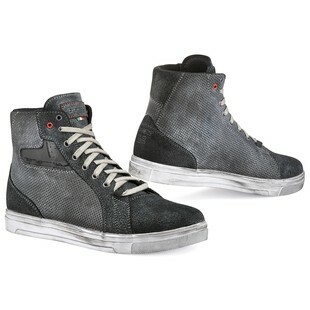 TCX upped the styling with perforated anthracite leather to give this shoe a vintage cafe look. TCX’s Comfort Fit System ensures these shoes will be just as comfortable in the bar as on the bike. Additionally, if you are looking for more all-weather wearability, the TCX Street Ace WP Shoes are also available. The TCX Street Ace Air Shoes offer a new, stylish take on a tried and true formula for comfort and protection.